In honor of this year’s forthcoming International Nelson Mandela Day, held each July 18 on Mr. Mandela’s birthday, the Penguin Random House Social Committee hosted an office Mandela Day Raffle competition to raise funds for charity. 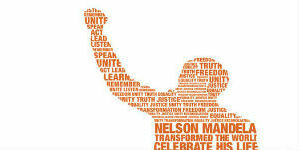 Our respective offices in Capetown and Johannesburg each selected organizations to benefit from our successful fundraising. Cape Town donated to the SAME Foundation to help fund their Leratong Hospital Children’s Ward renovation. The SAME Foundation is a non-profit organisation specializing in managing corporate social investment allocations to improve the health environment in South Africa. Since their national expansion in 2010, SAME has renovated and fully equipped five units within Leratong Hospital. The hospital’s Children Ward had often faced issues such as not enough beds, running at overcapacity, aged infrastructure, and an absence of life-saving equipment for doctors. With the help of Penguin Random House South Africa’s raffle funds, the SAME Foundation renovated and equipped the pediatric unit, enabling it to be on par or better than private facilities. Improvements included infrastructure extensions and additions, the latest medical technology and resources, as well as resting areas for the doctors and nurses in the unit. With its funds, our Johannesburg office financed supplies for the elderly at the Gerald Fitzpatrick Retirement Home in Bertrams, whose mission is to provide a self-sustaining, independent and secure residences for elderly ladies. The Johannesburg office also donated to the Senior Park Retirement Home in Witpoortjie, which offers independent living, assisted care, and full care. 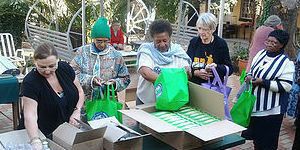 Residents received gift hampers, and each home received two boxes of books for their libraries. Since 2009, International Nelson Mandela Day has been a way to bring people together globally in an effort “to fight poverty and promote peace, reconciliation, and cultural diversity.” Penguin Random House South Africa is proud to join this year’s celebration and make a difference.